What better way to celebrate the women who gave us life than with music? With Mother's Day around the corner, we have compiled a list of 5 songs for mom. From Tupac to Ozzy, these are 5 songs you and your mom are sure to love! 1. "Mama I'm Coming Home"
Did you miss the ACM Awards yesterday? Don't worry! We've got you covered. Country music’s biggest stars rocked Las Vegas Sunday night at the 52nd Academy of Country Music Awards. 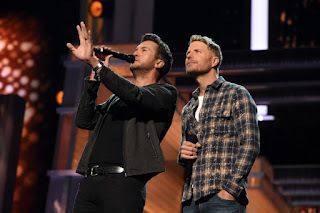 The show opened with a medley of performances by stars like Carrie Underwood, Luke Brayn, Keith Urban and Entertainer of the Year winner Jason Aldean. Florida Georgia Line were also part of the opening, but their big performance was at the end of the night when they were joined by Backstreet Boys to sing "God, Your Mama, and Me" and" Everybody." Co-hosts Luke Bryan and Dierks Bentley joined rocker Joe Walsh for a tribute to rock legend Chuck Berry, singing his 1955 classic, "Johnny B. Goode." Sam Hunt surprised his fiancee Hannah Lee Fowler by singing "Body Like a Backroad" directly to her in the audience. Thomas Rhett took the award home for Male Vocalist of the Year and Miranda Lambert did a solo acoustic performance of her song "Tin Man" and later won the awards for Female Vocalist of the Year and Album of the Year.